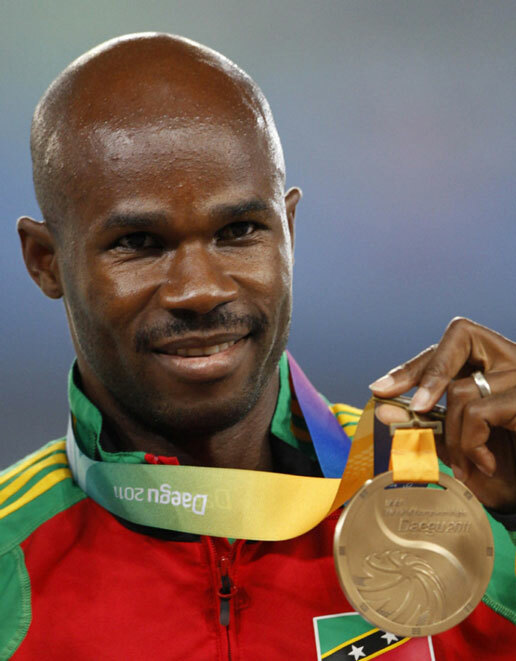 The Federation’s sprint legend Kim Collins is expected to compete at the upcoming National Track and Field Championship at the stadium named in his honour, where he is competing to make what many believe would be his last Olympic Games. Collins has achieved personal milestones over the years and qualifying for the 2016 Rio Olympics would be another goal on his long list of things he wants to accomplish. A video circulating on social media shows Collins being interview by a media entity nuffinlong.com shortly after winning the 100m at the Birmingham Diamond League event in England, showed the sprinter expressing displeasure that he was not given a direct entry to Rio. But, Public Relations Officer at the St. Kitts and Nevis Amateur Athletics Association (SKNAAA), Evris Huggins said Collins is expected to compete June 18-19. Recently Collins attained a world record of 9.93 to become the first man at the age of 40 to break the 10-second barrier which resulted in congratulatory remarks from the National Unity government. “I achieved my first goal and that was to go under 10s at 40 years, and I am hoping to get a free pass at Rio…” said Collins during the post-race interview. According to Huggins, one of the prerequisites for athletes to qualify for the Olympic Games is that they must participate at their respective national championship in order to make the teams. In 2015, during the Federation’s hosting of the CARIFTA Games, the Government of National Unity and the SKNAAA paid homage to Collins when they renamed the Silver Jubilee Stadium in his honour. The 40-year-old sprinter has placed St. Kitts and Nevis on the world stage as one of the top sprint countries in the Caribbean region and by extension the world. Collins has brought a number of medals to the Federation since his debut in 1996 at the Atlanta Games. His most remarkable accomplishment to date was a Gold Medal at the 2003 World Championship. To date, Collins has featured at four Olympic Games and a remarkable nine World Championship, capturing two indoor and five outdoor medals.